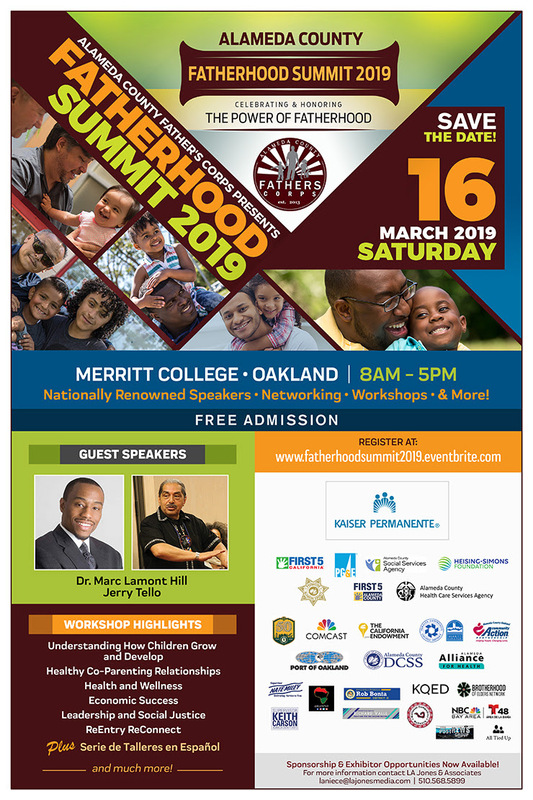 Please join us for the Alameda County�s inaugural Fatherhood Summit, hosted by the Alameda County Fathers Corps (ACFC), to celebrate, honor, and acknowledge the critical role fathers and father-figures play in their families and communities. Register here to be one of the 1,000 attendees at this free all-day summit designed to provide a safe space for important dialogue, networking and resource exchange focused on supporting your journey of fatherhood. A growing body of evidence shows that when fathers are actively engaged, children are far more likely to achieve success in school, careers, relationships and other aspects of life. Conversely, children without an actively involved father in their lives are significantly more likely to suffer from depression and other mental illness, drug and alcohol abuse, teen pregnancy, school failure, poverty, delinquency, crime and other negative life factors. Be part of the movement for change - Register Today!